The political tactic of neo-Marxist progressives has not changed much since those days in 1940s. The mainstream media today is, however, very much different. This is also a textbook case of how to expertly manipulate intellectuals in the Free World and how many among them, unencumbered by common sense, undermine liberty and enable worst abuse of human rights. Two cultures and science illiteracy of "intellectuals"
In New York City last weekend a strange furor surrounded the Waldorf-Astoria Hotel. Inside was gathered an oddly assorted group of thinkers from all over the world. Outside milled a loud and angry group of pickets, proclaiming that the proceedings were strictly pro-Communist propaganda. Between the picketing and the chance to see some real live visitors from behind the Iron Curtain, things were really in an uproar. The meeting was called the Cultural and Scientific Conference for World Peace, and it was an outgrowth of the cultural conference of 1948 in Wroclaw,Poland — at which the U.S. writer and artist were described as producing"disgusting filth"marred by the dollar sign. Its host was the U.S.'s own National Council of Arts, Sciences and Professions, dominated by intellectuals who fellow-travel the Communist line. The foreign guests were mostly from Russian-dominated countries where intellectuals can travel in only one direction. Russia sent seven delegates, headed by Novelist A.A. Fadeev and Composer Dmitri Shostakovich. Poland sent three, Czechoslovakia four, Yugoslavia five. Some 20 other would-be delgates were forced to stay home by the U.S. State Department, which refused them visas. In this connection, the State Department was torn between two motives. It hesitated to extend more privileges to Communists than Russia would give the U.S. Yet it wanted to show that free speech is still granted in America — even to severest crtics. In many respects the Cultural and Scientific Conference for World Peace was a comic opera — even though it had tragic implications. There was no doubt that it had been engineered by Americans who knew exactly what they were doing — i.e., providing a sounding board for Communist propaganda. Every time the Russian delegation stood up it got a tremendous ovation. But among the speakers were many gentle souls, a little bewildered by the world outside their laboratories and textbooks, who were sincerely looking for world peace and who embarassed the fellow travelers mightily by putting at least half the blame for the cold war on the Russians — which was the last sort of heresy the fellow travelers wanted to hear. Also among the speakers was one absolute ringer, Editor Norman Cousins of the Saturday Review of Literature, who got up at the main banquet in the Waldorf's plush Grand Ballroom ... and made a ringingly pro-American speech (which brought some hisses). There was one hillarious incident when Dr. Sidney Hook of New York University, leader of the anti-Communist intellectuals, burst into the hotel room of Dr. Harlow Shapley of Harvard, the chairman of the conference, to protest being frozen off the list of speakers. Dr. Shapley cleverly manuevered Dr. Hook into the hallway, then quickly retreated back to his room, locking the door and refusing to come out again. All told the pro-Communist propaganda fell a little fat, as far as the vast majority of Americans was concerned, and the meeting seemed to wind up in a victory for free speech. Offhand it might seem that a propaganda meeting like the one in New York last week would have been regarded by almost all Americans with scorn. But the Communists prepare carefully for such eventualities. Their weapons are the fellow traveler and the so-called "innocent dupe." These are the prominent people who, wittingly or not, associate themselves with a Communist-front organization and thereby lend it glamor, prestige, and the respectability of American liberalism. They are not the most notorious 50 [shown below] but a representative selection ranging from hard-working fellow travelers to soft-headed do-gooders who have persistently lent their names to organizations labeled by the U.S. Attorney General or other government agencies as subversives. In the beginning such people were prominent liberals who were lured into sponsoring or joining organizations that seemed American enough at the time. When the Moscow-directed line emerged, numerous liberals quit. But others like those below stuck it out. Some of them were receptive to shrewd Communistic persuasiveness. Some in high position stubbornly ignored their critics in the honest belief that there would eventually be a meetings of minds. Still others cynically pursued a personal ambition, thinking that the Communists could help them along their careers. Not a few became so notorious that they were accused of being actual members of the party. Some of those pictured here publicly and sincerely repudiate Communism, but this does not alter the fact that they are of great use for the Communist cause. Indeed membership would damage their special usefulness. Innocently or not, they accomplish quite as much for the Kremlin in their glamorous way as a card holder does in his drab toil. The Communist-front organizations have been exposed often enough, however, so that by now the perennial joiner whose friends try to excuse him because he is "just a dupe," is clearly a superdupe. Life showed (pp. 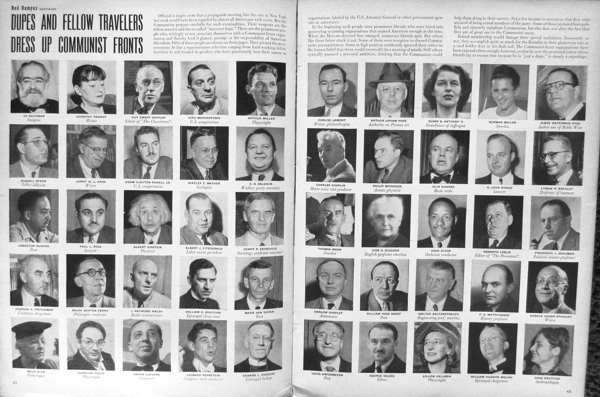 42, 43; above) the photographs and names of the following "Dupes and Fellow Travelers [who] Dress Up Communist Fronts"
Guy Emery Shipler, Editor of "The Churchman"
Kenneth Leslie, Editor of "The Protestant"